Janssen has been nominated for the 2016 Galenus Prize for the development of Darzalex® (daratumumab), a breakthrough in the treatment of multiple myeloma. The annual Prix Galien is awarded for the most significant and innovative medicine for human use. Multiple myeloma, also known as Kahler’s disease, is a relatively rare but incurable form of blood cancer1. Despite significant advances in the treatment of the disease, the average life expectancy at the time of diagnosis is about five years2 and at present all patients eventually experience a relapse1. There is a serious need for new, effective treatments, so Janssen has taken on the challenge. ‘Our ambition is to develop transformational drugs that have a significant impact on patients’ lives at different stages of the disease,’ says Tine Casneuf, Director of Preclinical and Clinical Translational Research at Janssen Oncology. Arresting the progress of terminal diseases such as multiple myeloma at an early stage: the development of innovative medicines by the Janssen Oncology team has brought us a step closer to this goal. The Prix Galien has been awarded annually since 1982 to the most significant and innovative medicine introduced in the previous year. Janssen has received the prize on six occasions since then. 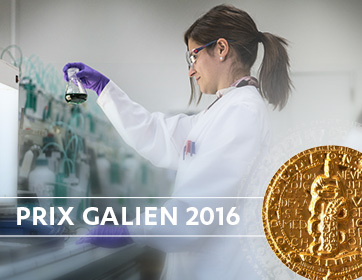 The nomination for the 2016 Prix Galien is a recognition of the quality of Janssen Oncology’s scientific work. ‘But we’re not stopping there,’ says Tine Casneuf. Janssen wants to turn cancer into a chronic disease and even prevent it from occurring. At present, research is therefore focusing on the initial phase and the progression of multiple myeloma. Insights from clinical studies are being combined with knowledge from academic research projects and brought into the laboratory. ‘The ultimate goal is to create a world without myeloma, and I’m hopeful that we can achieve that one day,’ says Tine Casneuf. This recent development contributes to the current transformation of multiple myeloma treatment, and confirms Janssen’s position at the forefront of medical innovation. 1. Kumar S, Paiva B, Anderson KC, et al. International Myeloma Working Group consensus criteria for response and minimal residual disease assessment in multiple myeloma. Lancet Oncol. 2016;17:e328–346.